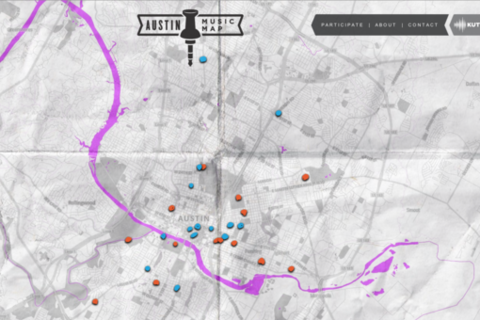 KUT-FM’s Austin Music Map (AMM) is a year-long exploration of the city's abundant and diverse musical subcultures. Blending on-line, broadcast, and street media, it’s one of 10 public media innovation projects that AIR is producing for the national Localore initiative (see airmediaworks.org). Join AMM creator/producer Delaney Hall, Kara Oehler of Zeega, and Jessica Clark of AIR for an immersive digital tour of Austin's off-the-radar venues. The trio will then lead attendees through a workshop-style discussion of strategies for creating "full spectrum" interactive docs. Experience the power of Austin’s musical underbelly by bicycle, post-panel. Hall will lead a group of adventuresome bicyclists to musical outposts from the map on a tour designed explicitly for SXSWers. We’ll meet/greet scene-makers at venues such as the White Horse and Esquina Tango. The tour is free, but space is limited. Sign up today at http://airmediaworks.org/BikeTour. Jessica Clark is AIR's media strategist, and an internationally recognized expert on the transformation of public interest journalism. Learn more at airmediaworks.org. Delaney Hall is an independent radio and multimedia journalist based in Austin, TX. She’s the lead producer of the Austin Music Map, an interactive documentary project produced in collaboration with KUT/KUTX, Zeega, and Localore. She's worked extensively with the Third Coast International Audio Festival in Chicago, where she produced Re:sound, Third Coast’s weekly remix of documentaries, music, field recordings, and found sound for Chicago Public Media. She’s reported on circuit benders, sound artists, early hip hop lore, hidden literary archives, and more for a variety of local, national, and international programs. She's also taught sound production and radio documentary to students at Street Level Youth Media and the University of Chicago. Hall studied at the University of Texas and the Columbia School of Journalism. She's originally from Albuquerque, NM.